It starts off with Taiki having a dream about leading a Digimon army with himself as its "General" against one consisting of several Mammon, Rhinomon and Valvemon. He then Digixroses Shoutmon, Balistamon and Dorulumon into Shoutmon x4 who effortlessly takes out most of the oppossing army. Oversleeping, Akari wakes him up with a "move" she calls "Akari Strike". After being encountered by Zenjirou, Taiki suddenly hears a melody from out of nowhere with Shoutmon crying out. Taiki starts searching for the source of the voice in order to save him. Chasing after him, Akari and Zenjirou witness a car about to fall on top of Taiki, but he narrowly escapes its path thanks to Shoutmon's warning. Suddenly, the buildings and surrounding space begins to distort, causing electronic disturbances. Afterward, Taiki discovers a light along with a melody, then a mysterious voice says "do you want to save this melody?" and a Xros Loader appears. After following further instructions from the same voice, and once the melody is absorbed by the Xros Loader, Taiki, Akari and Zenjirou fall into a wormhole-like digital space which emerges on the ground, transporting them to the Digital World. Once there, they are in the middle of the Bagura Army, the same army Taiki saw in his dream, lead by Mach Leomon. It's very easy for a passerby to overlook this manga as some kind of abridged adaptation of the Xros Wars anime and pass it up because of that. The Xros Wars anime is kind of a hit-or-miss series for many Digimon fans, and so those who found it a hit with them are likely to ignore it thinking it's just a short adaptation while those who found it a miss will think that it's just going to be a reiteration of something they didn't like. 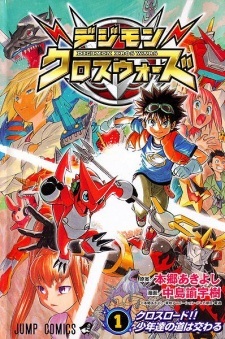 But anyone who skips over this manga is definitively missing out, because this "spin-off" is an incredibly high-quality story with few or none of the shortcomings one would expect from a manga based off a Digimon anime. Firstly, it should be mentioned that this manga being an "adaptation" of the Xros Wars anime is a fallacy. The first chapter of this manga and the first episode of the anime cover the same plot, and from there they go in completely different directions. In fact, the best way to approach this manga is to completely forget everything about the anime and go in with a blank slate, because other than their basic character profiles, even the main characters don't resemble their counterparts in the anime. Even if you were to compare this to the anime, it even fills in many of the severe flaws plaguing the anime version, so those who wish to read this after having seen the anime may find something that they were hoping to see there. Characterization, plot - all of it is thoroughly solid and coherent, perhaps more so than even other entries in the Digimon anime canon. Main character Taiki's motivation for acting the way he does - "I can't leave them behind!" - are thoroughly explored in detail, including the positive and negative aspects of such thinking, and what kind of backstory it takes to drive Taiki to think this way (unlike the anime version where said backstory took up a few minutes in air time, manga Taiki's backstory is explored in detail and spans two to three chapters). The two other human members of Xros Heart, Akari and Zenjirou, are established very early on to not have the ability to DigiXros, yet they stay perpetually relevant through the plot (Akari in particular), contributing helpful efforts and going through their own arcs. From the strong core character cast comes the plot, which is very clear-cut and linear - it begins at point A and ends at point B, and, aside from an intentionally ambiguous plot twist concerning the origin of two characters presented at the end of the series, every plot point and plot twist is carefully executed and presented in an understandable way. The Xros Wars anime is also rather (in)famous for a certain anniversary special in which there was a large crossover featuring the previous anime protagonists. This manga, similarly, honors the roots of the Digimon anime (Nakashima seems to be quite intimately familiar with the franchise), but carries it out in a much more subtle and tasteful manner. You don't see any huge crossover where characters from other narratives barge in as much as you see small references to prior series here and there. This is not to say that there aren't any shortcomings; while rival characters Kiriha and Nene have their motivations deeply explored, with solid personalities and backstories, neither show up quite to the degree that they do in the anime (Nene more due to a certain plot reason that would be spoiling to mention), and thus the readers don't get to see as much as they would have seen them through the anime. There's also the above-mentioned plot twist, which can't be gone into detail here for more spoilers, but raises a lot of questions about the universe's canon. All this is helped by Nakashima's art, which is very clean and quite expressive; the facial expressions of the characters really bring out a lot of their personalities and are quite entertaining to look at in the meantime. The art style does well for both the human characters and Digimon, managing to bring out funny moments when they need to be funny and dramatic scenes when they need to be dramatic. Overall, this manga is quite a solid work and it's a shame that it's buried under the concept of a "spin-off" (and, thus, at risk of being overlooked more easily than it deserves for it to have been for its quality). I risk committing heresy against years of fandom tradition by claiming that it might just have better writing quality than some of the oft-beloved Digimon anime series. For any fan of the Digimon franchise - or perhaps just anyone in general looking for an adventurous story with strong characters - this is definitely worth your time. Xros Wars was already my favorite anime in the series, but the manga is even more epic than I expected. Kudou Taiki, a guy who can't stand not helping others out, hears Shoutmon's dying melody and decides to help him. Thus he gets the Xros Loader and sets foot on the Digital World along with his friends Akari and Zenjirou. Once he helps Shoutmon out he discovers about the Xros Wars and the Legend of the Generals, people who would have the power of DigiXros. The world is in a collapsing state, having been divided in zones due to a major war between the Bagra Army (the villains) and the Royal Knights. Also, unlike previous Digimon series, evolution is a lost art that no digimon knows about in Xros Wars. There are many differences between the anime and manga. For instance, unlike the anime series of same name, Bagramon's past is really well explained in Xros Wars manga. Also, one of its most appealing factors is the fact that it deals with materials that make reference to Digimon Adventure, 02, Tamers, Frontier, Savers, Xros Wars Hunter, the Wonderswan games based on the Legendary Tamer and more. Even though all the Digimon mangas are superb, I'd call this one the definite Digimon manga (for now, at least). If you are a fan of the anime and really loved the previous anime series as well, you'll certainly enjoy this manga. Easily the best story, even better than Digimon Tamers.